MEANING OF NAME: Name was given to him by his previous owner. “Montom” actually means black in Dusun language. HISTORY: The Sabah Wildlife Rescue Unit rescued Montom from Kampung Melangkap, Kota Marudu on January 18th, 2015 and sent him to the BSBCC on January 21st, 2015. The story reported to the Wildlife Rescue Unit was that their dog chased away his mother and she left Montom behind. He was taken and kept as a pet for a year in a chicken wire mesh cage and fed with human food. The owner was willing to surrender Montom to Sabah Wildlife Department’s Wildlife Rescue Unit. He weighed 26.8kg on arrival. PERSONALITY: In August 2015, we introduced Montom to the other sub-adult bears and were pleased to see him get along well with all the bears. He is a friendly and playful bear. Montom can eat extremely fast. He enjoys his freedom around the forest. He likes to play with Kala. He continues to chase her around in the forest even when she has decided they are done playing. 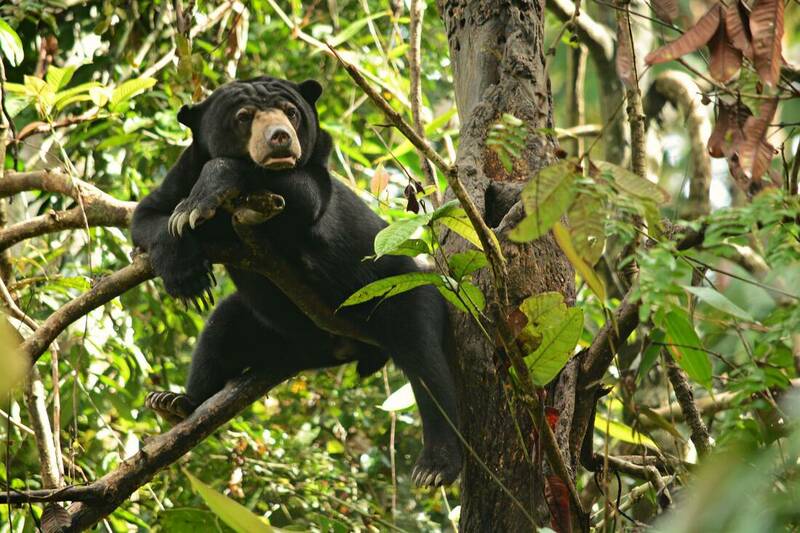 It is endless fun to watch these rescued sun bears rolling around and playing in the forest just like children. He is a good tree climber, he will not miss the opportunity to climb up and spend most of his day sunbathing in the trees. His enthusiasm for life is a delight to see. Montom is available for SHARE BEAR adoption.